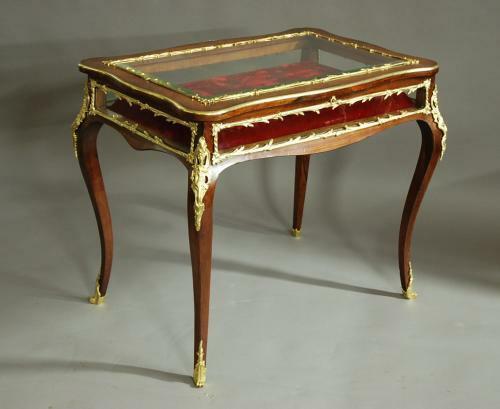 This highly decorative table consists of a shaped top with original bevelled glass (with some scratches) with a decorative ormolu moulding surrounding, also with a shaped ormolu moulding framing the lid. The interior has a base of neutral velvet fabric and also a removable raised insert with a red velvet fabric and chamfered edges - these could be changed to a fabric of choice. Each of the front, back & side glass panels is framed with the same decorative ormolu moulding, the rails are all shaped and have a decorative foliate ormolu mount to the top of each leg. The four tapering cabriole legs all terminate with a decorative ormolu mount. This table is of very good condition, of stable construction and can go straight into a home.